Most people have seen video or photos of motorcycle racers (or not very smart street riders) dragging their knee while leaned fully in the middle of a corner. Every motorcycle event photographer knows that the money shot that every track day rider covets is the one showing the rider’s knee puck solidly in contact with the pavement. It’s the shot that confirms a rider’s sport riding prowess and impresses even the most uninformed co-worker or family member. Showing this gem of a photo to non-riders usually congers a reaction that usually sounds like: “OMG, are you hitting your KNEE?”, “Doesn’t that hurt?”, and “You’re crazy”. Even fellow motorcycle riders who are not attuned to performance riding may react in a similar way, not understanding the reasons behind what seems to be a stunt or party trick, rather than a useful tool. Read this Article about the Real Value of Knee Dragging. Those who have never thought about it before may think that dragging a knee would be a foolish thing to do. Surely, no good can come from placing your knee on hard, rough pavement at a high rate of speed. They probably have visions of ripped flesh, torn ligaments and shattered knee and leg bone. The Motorcycle Safety Foundation certainly does not have it in their course curriculum (although some students do ask about it), so it must be unsafe, right? You drag your knee on the street where the environment cannot safely support those kinds of lean angles. That’s right. only three situations that I can think of. The curbing problem is easily avoided by raising your knee to avoid contact with a curb. The second situation is not as easily remedied. Yes, the easy answer is to not ride beyond your ability, but reason can be allusive to a novice rider who desperately wants to put “knee dragging” on his resume. And finally, attempting to drag knee on the street is not a great way to manage risk. There are too many variables on the street that make knee-dragging lean angles downright kookie. To answer one of the most common questions laypeople have about knee dragging; “Yes, I wear a special knee puck made of plastic or nylon that is secured by a large panel of hook-and-loop material that skims smoothly across the pavement surface” … “and no, I don’t do it on the street”. I don’t personally know anyone who would do this (as far as I know), but there are those who try to fool their peers by belt sanding a virgin knee puck at home. Believe it or not, I’ve also heard of riders selling used knee pucks on ebay for wannabes to proudly display as their own. I suppose there’s no harm in that. 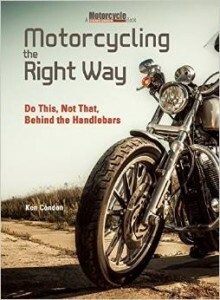 It’s better than the rookie pushing too hard and crashing his or her motorcycle. But, this hoax is rather pathetic. It goes to show how this ability holds a high honor among the sport riding crowd. 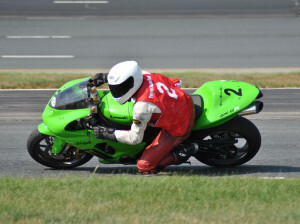 MZ Scorpion racebike in turn 2 at NHMS (Loudon), 2005. How far over you’re leaned…sort of like a lean angle protractor. As a quick-turn gauge: When you touch your knee can measure how quickly you are initiating lean. Your corner speed: How long your knee remains on the ground measures your corner speed and the duration of your established lean angle. How early you are “picking the bike up” as you exit the corner. This can also indicate how early and hard you are getting on the gas. As a learning tool to become faster and more consistent. If you touch down earlier, this indicates that you are getting your bike turned quicker. As a reference point measuring device. After you have a track dialed in, when and where your knee touches down should be consistent from lap to lap. Another use for having your knee on the deck is to save a crash if your motorcycle starts to slide. I’ve rarely ever used this tool to save a sliding bike, but having a third point of contact can relieve the overtaxed tires enough to save you from a crash. It doesn’t always work, but it is certainly worth a shot. Note that this article discusses the specific topic of dragging knee. It is assumed that you already know the purpose of hanging off the inside of the motorcycle. My friend Paul helped get me fast enough to start dragging my knee. “How do I learn to drag a knee ?” is the age-old question. The answer is that you don’t. Yes, there are body position techniques that need to be learned, but good body position is not unique to dragging a knee, or track riding for that matter. You will need to learn how to hang off a motorcycle properly (but that’s the subject of a future post). The take away here is that you need to know the fundamentals of expert cornering before you can safely drag a knee. 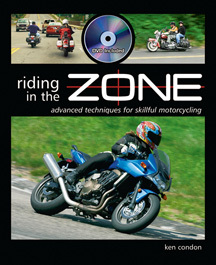 There are people with less than excellent cornering technique that can drag a knee, but they are usually unaware of how close they are to a crash, because they are using enough lean angle to touch knee, but don’t have the skill to ride at those cornering speeds. They are usually riding at near 100%, which almost always turns into 101% at some point and down they go. Do more track days, gradually increasing your cornering competence. My motto is “Let the ground come to your knee, rather than force your knee to the ground”. Skill comes first, then speed, then knee dragging. Your turn. What is your experience with knee dragging. Why do you do it? What helped you? I’ve been doing Track Days for a couple of years now, after riding for close to 50 years. I always wanted to get my knee down, but really, I’m not easily able to, so I have learned to let the track come to my knee. Since I cannot sit “cross-legged” (I’m at less than 90 angle after 3 years of hot yoga!) I’ve come to realize that it will be harder for me even with the correct body position, so I trying to focus on the other aspects of riding that can make me faster & safer/consistent and not worry about my knee. You might want to add, the real reason why the Knee Drag position was use for, was to keep the bike itself from leaning too far, and still being able to take turns at high speed. So Really a bike ridden in the “Knee Slide” position is not actually leaning as much as a rider going the same speed whilst in an upright riding position. Indeed. That is covered in the body positioning articles elsewhere on the site, but deserves to be mentioned again here. Thanks. I’m not understanding all the hate regarding knee down outside of a track. There a plenty of places and corners where this is possible, of which I’m sure a number of people are very familiar. Don’t go dragging the knee everywhere sure, but finding a nice piece of road somewhere that is safe and practising isn’t that bad compared to the stupid stuff some people do. 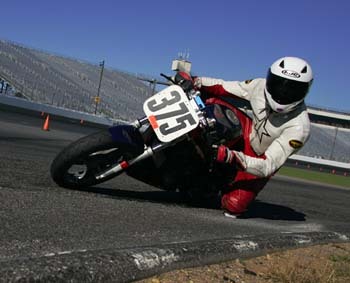 With proper technique you can touch your knee down relatively easily and safely. First got my knee down spending hours practicing a smooth left handed curve at about 20MPH until my body position techniques allowed me to add more speed. By the time I hit about 25 through this curve I finally got my knee down. At that time I decided I was ready to give the Tail of the Dragon a try and sure enough I had my knee down through almost every curve, especially those switchbacks! Looking forward to my first actual track day at Thompson Motorsports Park 6.15.15! Body position/arm technique does make a big difference! I’ve been trying to get my kneedown for almost 2 years. Yes I know. I did touch tarmac, but not like it should be (just briefly). I was out there on my first track day ever in the intermediate class. I was dragging knee second lap around after I got the tires sticky. At first I was like oh crap. This is cool. But by the end of the day I was using it as a gauge of how much lean I had left before I was on the razoredge of the tire. I also used it inturn with the apex. It’s not all about getting your knee down though. It’s how fast you can take thay turn. I can take the same turn just as fast with my knee down. As with my knee up. But my most useful tip with the knee down. In a lefthander persay. (The lightbulb at ncbike north carolina) put your head were your mirror is. Your right buttcheek on the left side of the saddle. Tip of the boot on the peg and get o over with it! This was a skill that bothered me for a couple seasons. After a half dozen track days or so I still had not touched a knee down and like many beginner track day riders, I wanted the scuffed puck as my badge of honor. I didn’t even fully understand why I wanted that pesky slider to glide across the pavement, but I was frustrated I couldn’t make it happen. I would regularly follow riders who were riding at a pace slower than my own and watch them drag knees through every corner. What I didn’t realize at the time was that they were either fighting to get their knee to the pavement or their poor body position required greater lean angle out of their motorcycle allowing their knee to be closer to the ground. The only thing that I had really needed to do was ride a little faster. That’s not as easy as it sounds though and for me it took having confidence in following my instructors and confidence in my bike. A good instructor will understand your capabilities and help you over that threshold you’ve been trying to cross in as safe a manner as possible. Having confidence in your motorcycle or tires is a very internal issue that I believe most new track riders struggle with. Once my knee did make contact and the initial excitement wore off, it became a very useful tool for gauging lean angle, establishing reference points and I believe has helped me recover from 2 front end slides. This past season I encountered a new “problem” which was leaving your knee down too long. It eats through knee pucks, which aren’t necessarily cheap. So now I use the knee for initial turn in as reference point and to protect from a front end slide. After that, I let the knee hover or very lightly touch the pavement so I can conserve slider material while having the gauge very close to measure lean angle if a minor steering input is required. Eventually it becomes second nature and will help riders advance through the next goals they’re trying to achieve. Great post, lots of good info. Personally, I am rather slow overall but, I have no problem sliding over and hanging off my bike in corners, my knee is not always down and the first time it did hit, the track came to me really, I bounced in TURN 3 at Loudon in NH. This was about my 3rd track day and once it happened, I was able to get my knee down a lot, not all the time and not really consistently but I get down… What I need is to better position the puck, it’s clearly in the wrong spot because the bottom corner is the only part touching the ground. A (sad) side note, I have new pucks, my suit was replaced and my (scratched) pucks went with it.